I attended this wonderful influencer and business conference last year, and could not wait for it to come back around. That I got up at the crack of dawn last week-end, after the Dear Evan Hansen opening the night before, (which is perhaps the longest show in history!,) to go to this all-day event tells you how much I enjoyed the previous one! And my feelings about this year’s rendition are the same. 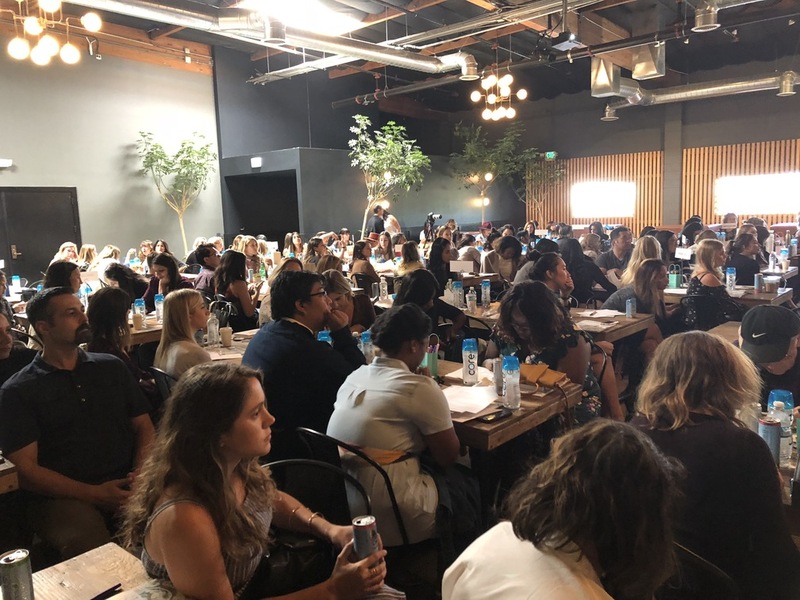 The Collective Conference was held once again at the perfect-sized Playa Studios in Culver City, and hosted by the lovely ladies of 360 Dots. Three of them invited me separately, and all their correspondences were so pleasant. That’s a rarity in this business! Photo by Karen Salkin, as is the one at the top of this page. 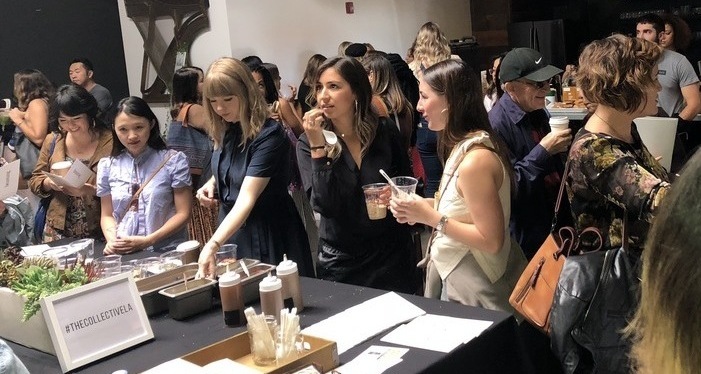 We began the day-long conference with a morning mingle, which included lots of healthful snacks, such as vegan coconut yogurt and granola, along with some snack bars and beverages. Then we moved into the same event space as last year, but with a twist. It was differently configured, and featured long wooden tables, (as opposed to round tableclothed ones,) and lower seating for the panels. I appreciate them mixing it up each time. But I loved that they did not change my favorite part. 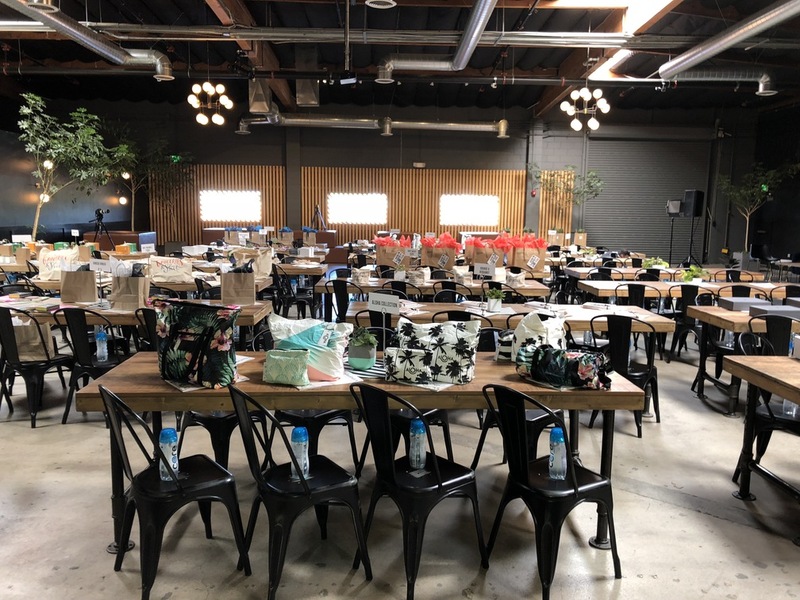 Instead of everyone receiving the very same gift bag, each table of eight had something from a different product sponsor. And they sent an alert ahead of time, telling us just what the gifts were, so we could aim for our desired seat. One had jewelry, another make-up, several featured various kinds of bags, and there were even jars of salsa and boxes of vegan treats! All that was very appreciated, by me, at least, but I’m sure by all in attendance, as well. Also appreciated is that there were bottles of water on each chair, rather than on the tables, so they wouldn’t obstruct our view of which gift we’d like best. Very thoughtful of the organizers to do it that way. 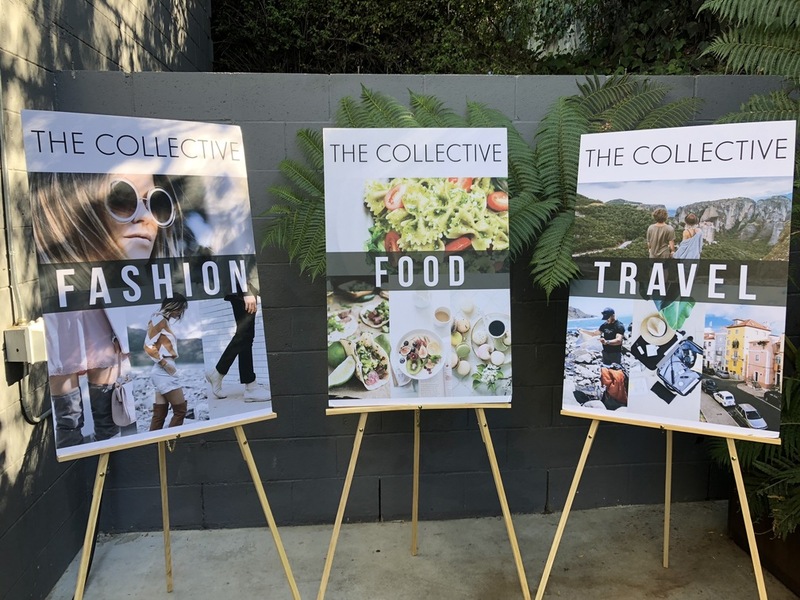 This Collective Conference focuses on food, fashion, and travel, three of my main areas of expertise, so I, of course,was happy. Speaking of fashion, I love that there were so many different types that day!!! I saw a little bit of everything on the guests. That was so interesting. One of the panels. And no–that is not Taylor Swift in the center! Photo by Karen Salkin. The body of the day was comprised of informative speakers and panels. 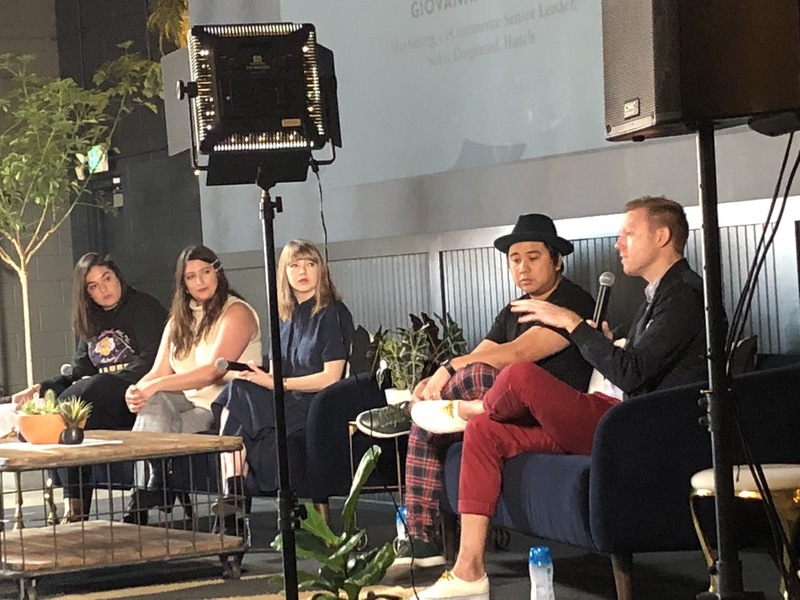 There is so much going on in the world right now that it’s often hard to keep up with it all, in every walk of life, and this conference helped break it all down for us, in terms of business, life goals, and social media. Several good points were made along the way, like how misleading social media can be. Most of the speakers were pretty honest about how unrealistic it is. And I applaud that so many are finally hip to the stress that that fakeness can cause. The only panel I definitely did not need was the storytelling one. My stories are the reason you’re all reading this to begin with, right? And the reason that fans of my former TV show constantly ask me to resurrect it, (which I soooo appreciate, by the way.) I was very happy to see that the Collective was celebrating that art. Very astute of them. Just part of the lunch. Photo by Karen Salkin. 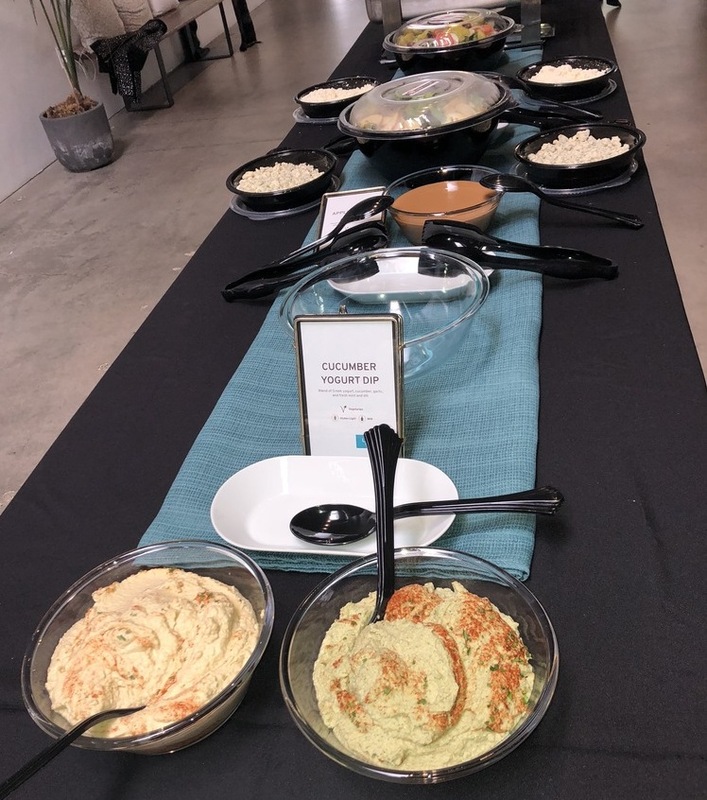 You all know that I’m a fan of any event that feeds us, and the Collective Conference did just that. All day! From the morning snacks to a beautiful, healthful lunch provided by Luna Grill, and then a snack break in the afternoon, and then more chow when it was all over. They really took care of us. And it was all perfectly spaced-out, time-wise. Even food-obsessed yours truly never got hungry! In addition to meeting several very nice new people, and learning some helpful lessons, this conference did something surprising for me beyond all that. It reminded me to feel good about myself, in several ways. A few pieces of advice on offer that day are things that I already do, and when we did an exercise about where we want to be a few years down the road, I realized that I’m already there! As the girl who is often referred to as “the original reality show,” I wonder sometimes if I’m going backwards in life, giving up my TV show to do this e-zine. This conference made me realize that I’m exactly where I should be now, which I really thank them for. After having to miss the closing festivities last year because, as usual, I was overbooked, I was really happy that I gave up seven other events this time so that I could stay till the very end. And I was rewarded for that perseverance with a boutique, and some really delicious snacks, including incredible waffles, from a quartet of eateries around town. And even more mingling, which was also an excellent networking experience. No one rushed out of there, which is such a tribute to this affair. It was all very upbeat and relaxing. And oh those waffles!!! Once again, I now can’t wait until next year’s Collective Conference!